Ivanka Trump’s recent move into an office in the West Wing, despite her earlier protestations that she would not be taking a role in Daddy’s administration, has brought to mind another high-profile presidential daughter of recent times, Uzbekistan’s Gulnara Karimova. In American politics, there is little precedent for a president’s daughter taking on an advisory position in the White House. Maybe it is fitting to look at the rise and subsequent fate of the daughter of Uzbekistan’s late president Islam Karimov. Gulnara Karimova, also known as GooGoosha, was once a high-flyer in Uzbekistan, dabbling in telecoms, show-business, high fashion, charity and construction – some even spoke of her as being next-in-line to the throne, but she suffered a spectacular fall from grace in March 2014 when she was placed under house arrest in Tashkent following a huge corruption scandal. Little has been heard of her since. Keeping this in mind, Ivanka had better make sure she doesn’t get the wrong side of Daddy Trump, who is said to model himself on Karimov, the strongman president who ruled Uzbekistan for 25 years until his demise in September 2016. Trump’s campaign slogan, “Make America Great Again,” is said to be modelled on Karimov’s “O’zbekiston kelajagi buyuk davlat” (Uzbekistan, the state with a great future). These two cantankerous old guys both share a hatred of the free press, are prone to making bizarre off the cuff remarks, bear grudges indefinitely and are fiercely opposed to what they see as Islamic extremism. Ivanka should be mindful of GooGoosha’s fate, or else she may find herself locked up in a shed in the White House grounds. Lord Venal is just back from his latest election monitoring mission in Uzbekistan. He was part of the unofficial Non-Aligned Observation Missions International (Naomi) group which visited the country as it prepared to anoint Shavkat Mirziyoyev as Islam Karimov’s rightful heir. He’s kindly contributed this piece to kazaxia. Ah, Uzbekistan! What a show it put on as the reins of power passed to Shavkat Mirziyoyev. I was part of a group of assorted Lords and bigwigs that were flown in to legitimise the transfer of power. As usual, the Uzbeks pulled out all the stops to make our stay a comfortable and memorable experience. We were kitted out with regulation observer rose-tinted spectacles and whizzed by train to Samarkand to pay our respects to two tyrants. The more recently deceased one was doing a roaring trade compared with the earlier model, Amir Timur aka Tamerlane, who in comparison was receiving a modest trickle of visitors. The local flower sellers were doing good business – a possible opportunity for Britain’s gardeners to exploit in these post-Brexit times. Indeed, there could be many opportunities in Uzbekistan for Britain’s exporters as the new president looks like a character we can do business with. Mr Miriziyoyev has good contacts with figures from the world of alt-business in Tashkent – this enthusiastic alt-businessman even shared a photo of himself on social media, squeezed into a tee-shirt proudly displaying the president’s image. The election saw a campaign to eradicate the ancient local tradition of “one man, all the family’s votes” with the novel concept of “one person, one vote.” Unfortunately, I was feeling a bit under the weather on polling day, after having over-indulged in plov and local beverages the night before, so I am unable to confirm the success of this initiative as the polling station had closed by the time I got there. As to the result, once again, in the year of the monkey, the pundits got it wrong – our very own Gary Kefali had predicted a win for Khatamjon Ketmonov. Instead, Uzbekistan will venture into its brave new world with Mr Mirziyoyev at the helm. Maybe next time Theresa May’s in town, she could pop in for a cup of tea and discuss some mutually-beneficial trade deals with the new boss. Uzbekistan’s most famous awol pensioner is up to his old tricks again. Earlier this week he disappeared from the secure unit he resides in in Tashkent, Uzbekistan after making a speech on Uzbekistan’s Independence Day, 1 September. Nothing was heard of Mr Karimov until 3 September when he was spotted at an event in Beijing, China glorifying the Soviet Union’s great victory over Japan in 1945. The plucky Soviets declared war on Japan on 8 August 1945, two days after the first atomic bomb was dropped on Hiroshima and a day before the second was dropped on Nagasaki. The valiant Soviets managed to clear Imperial Japanese forces from mainland China in just over three weeks. Gulnara Karimova, who has been under unofficial house arrest since March 2014 in Tashkent, is set to be moved to a gilded cage in the centre of the city as part of a deal brokered by Lord Venal on his recent visit to Uzbekistan’s capital. 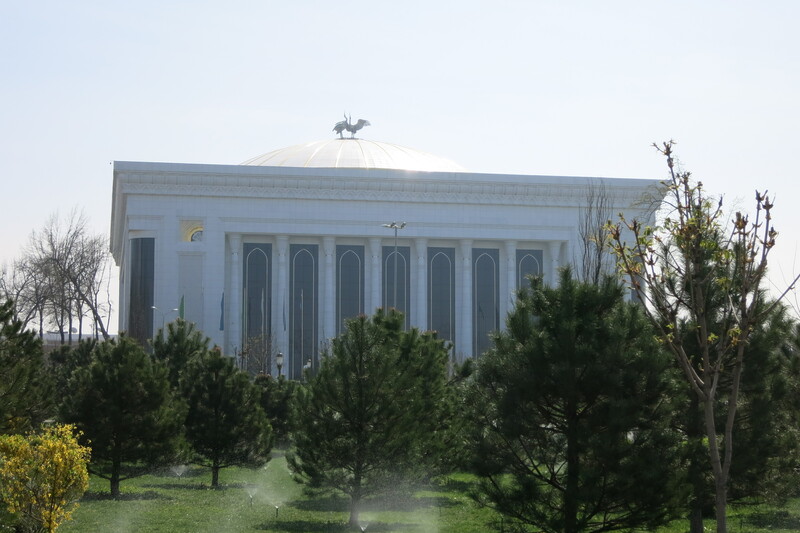 Tashkent’s Palace of International Forums – GooGoosha’s new home? Karimova, better known by her stage name of GooGoosha, is the eldest daughter of Uzbek pensioner Islam Karimov, Under the new deal she will be housed in the grandiose Palace of International Forums, which was built at the height of her power in the late 2000s. Since then she has had a spectacular fall from grace. In her new surroundings, GooGoosha will be able to shop to her heart’s content in a private shopping mall in the palace’s basement – modelled on Barbara Streisand’s personal mall. The complex will also include a medical centre for botox and other cosmetic surgery needs, along with a dedicated yoga ashram. A private nightclub will host holograms of her pals Sting and Gerard Depardieu for impromptu duets. Residents of Tashkent are happy that a use has finally been found for the imposing white marble edifice, considered by many to be a white elephant. There was unbridled joy in the mahallahs of Uzbekistan as the pensioner who went awol earlier this year swept to a landslide victory in the presidential poll on 29 March. Lord Venal was in Tashkent to observe the proceedings and here are his findings. The plucky voters of Uzbekistan braved chilly conditions to re-affirm their allegiance to the man who has run the country for the last quarter of a century. Support was down slightly for the septuagenarian leader at 90.39 % (he got 90.76% of the vote in 2007), but overall he remains the only show in town. The Uzbeks sure know how to organise a good election – we observers were wined and dined at every turn during our all too short visit. Election day began early with the traditional Osh Plov, platters of the national rice and meat dish served alongside three types of tea – green, black and white (or vodka to the uninitiated). Then it was onto a new shopping centre in Tashkent’s old town to see pensioners picking up free loaves of bread and subsidised, rationed staples such as rice and cooking oil. In the run up to the election the president remembered his fellow senior citizens with this largesse. It reminded me of the food bank Lady Venal has set up for the poor of the parish back home. After this strenuous morning, it was time for a lengthy lunch of more Uzbek delicacies and some cheeky wines from the chateaus of the Parkent Valley. I remember snippets of a fascinating conversation with the guys from the North Korean observer mission, but not enough to repeat here unfortunately. After lunch we visited a polling station but alas there were no voters to be seen as the turnout at this station had hit the 100% mark by lunchtime. Time flew past and before we knew it, we were off for a farewell meal after a long day of observing. Let’s just hope Kazakhstan can match the Uzbeks for hospitality when it chooses its president on 26 April.